Since November there has been a new type of activity that you can experience at the Walt Disney World Resort: Indy Car Racing. The Indy Car Experience now has a permanent home at the Disney World Race Track allowing you the opportunity to experience Indy Car Racing first hand. 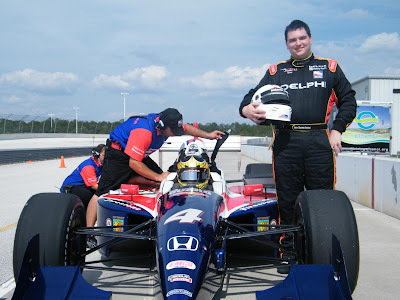 Ride in an IndyCarThe Indy Racing Experience Two-Seat Ride allows the passenger to experience speeds and g-forces previously available to only a handful of elite drivers. The purpose-built Dallara chassis allows a passenger to sit behind the driver, but in every other way, this is a true IndyCar Series car. The car is complete with an authentic racing power plant that can reach up to 180 miles per hour. Each driver must be 18 years of age or older, under 6’5” in height, and under 250 lbs. The Indy Racing Experience accepts walk-ups and also takes reservations. 0 comments to "The Indy Racing Experience Has Come To Disney World"